"We were pleased with the work." By Wayne And Robin S.
"The guys did a fantastic job! They are incredibly hard..."
Katie W. in Waukon, IA noticed that she had cracks in her foundation and water was seeping through the cracks into her basement. The water had started damaging her personal items in her basement, and she was concerned that the damage to her basement was only going to get worse. She started looking for a waterproofing contractor in the area and she came across the American Waterworks website. 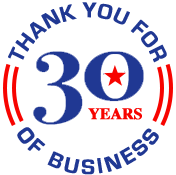 She was glad to see that we have over 29 years of experience in the waterproofing industry. She contacted us to receive a free estimate, so we sent a Design Specialist to her home to inspect her basement and design a solution. She was pleased with the proposal that we developed for her, so she scheduled the installation. Our production team installed a full perimeter of our WaterGuard drainage system in her basement and two lateral lines through the middle of the floor. We also installed our TripleSafe sump pump system- which is our most reliable sump pump. The drainage system properly guides water to the sump pump, and from there the water is pumped through the discharge line and expelled from the home. Our waterproofing system is backed by a lifetime warranty, so Katie can rest easy knowing that she chose the right solution to protect her home for the long-term. Wayne S. in Waukon, IA had water leaking into his basement. He was concerned about the damage that it was causing to his home and was worried that the air quality was being compromised, so he contacted American Waterworks for a free estimate. We sent one of our Design Specialists to his home to evaluate the situation and propose a unique solution to fit his needs. Wayne approved of the plan and moved forward with an installation date. Our Foreman, Kiko Pena, and his production crew got to work and installed 194 feet of our WaterGuard drainage system around the perimeter of the basement and the feed line through the middle of the floor. Then, they installed our SuperSump sump pump in the corner. The WaterGuard properly drains water to the sump pump and from there, the water is pumped through the discharge line and expelled from the home. Wayne is glad he made the investment to protect his basement for the long-term. I live in an old house that sits low. When the water table is high water comes up cracks in the floor. I have a sump pump that really helps but would like to stoop the water coming up through the floor. I don't want to spend a fortune, but like to see what I could do. We have lived here almost 30 years, the basement floor just leaked a small amount when we first moved here but now it leaks more and more, looks like comes from the corners in the basement. There is black mold down there now and some kind of fungus on the walls. I have cleaned and scraped and painted for the last 10 years but it is just getting worse as we did not fix the cause of the problem. Would like to get an estimate to have our basement waterproofed. Thank You! During a large rain last week we had a corner of the basement with multiple leaks, including some spouting. Driveway as you enter garage is about 4" lower at one corner and cracked. About 8x8 area breaking away. We have leaking between the bottom of the wall and the floor in five spots. Have never had a drop of water previously. New Home in 2004. Not a lot of water but is leaking after rain. The guys did a fantastic job! They are incredibly hard workers. Thank you very much! Did a good job. They were pleasant and nice. We've had a lot of concrete dust clean up in spite of draping off basement area to first floor of home. We purchased the dehumidifier, but the condensation ran on floor rather than coming thru hose. A service person came to see what was wrong and it was a simple check of having the unit level. This could have been checked after unit was plugged in. We had rain for a week and our basement remained dry. This is what we wanted for the end result, which makes the system entirely satisfactory. Thank you! Chad M. W. Iowa St. Wonderful job and the crew was very nice and accommodating. Definitely will recommend this company, crew and system to anyone! Doralee H. S. Egbert St.
We have been pleased with the results (in our previous home) and greatly appreciate the peace of mind we have now in our current home knowing that the basement work has been done. NexusPro is a durable binding agent used to repair cracked concrete slabs on your Waukon property. SealantPro seals concrete driveways and pool decks, restoring quality and protecting against UV, weather, oil and water damage for 3 to 5 times longer than other concrete sealants. Repair your concrete and seal in quality with our concrete protection system. Are you concerned about water in your basement or crawl space, or cracks in your foundation or concrete slabs? American Waterworks is your local expert in all of these services and more. We offer free estimates to all of our customers in Waukon, IA and throughout the surrounding areas. Schedule yours today!